Recently right before my father’s cancer diagnosis last week, my mother mentioned how she has a “hole in her heart” from me moving to Oklahoma with my 2 youngest children, and my daughter (her granddaughter and their little family) moving to Michigan. And I let her know that she can have a hole in her heart or have a whole heart. I know her heart is now yet again pierced with yet another “hole” with my dad’s diagnosis, but I still want to remind her she has a whole heart, My mother was a school teacher for over 20 years including special education and with her Master’s degree’s and teaching degree’s it was my mother that taught me many of those spelling words and the different meanings of them and when to use them..My mother taught me well with proper usage of these two words. I would also like to admit growing up, I know I was on the “slow” side however with my ADHD and many trips to the principles office for so many things I can remember most of them, my mother never medicated me, she never belittled me for not understanding everything like other children, she would work with me at the kitchen table in our house in Auburn Maine, she would have me read aloud sometimes in the house in Winthrop on the chair and without knowing it, she would give me little quizzes on things that would pertain to whatever I was studying at school. She would take me on boring drives to antique stores and point out historical houses and some (I thought) useless facts about the house or place she took me too. When I would get bored riding in the back seat (because of course back then we didn’t have portable DVD’s to entertain children, how did we survive), my mother would tell me to put my foot up and she would slip a little note on a piece of paper in between my toes with some sort of encouraging sentence or a question to which I had to think about to come up with the answer (I believe we called them riddles). There are days and times in our lives today that we find ourself with a hole in our heart or feel as though we can’t seem to find that missing piece of the puzzle and that’s the last piece we need in order for it to be complete. It looks perfect but there’s a hole in the middle where that piece is supposed to go. I’m on a journey in life to find and collect all my missing pieces of my puzzle that through the years have disappeared leaving a broken puzzle as it seems to some I’ve got a puzzle with missing pieces, but let me assure you I may never find those missing pieces that belong where there supposed to be, I have found the Peace I need to keep working on my puzzle which is my life. Many of us women who have had pieces stolen from us from either abuse, heartache or disappointments it is possible to put the pieces back in your life if you are searching for Peace and not those pieces you lost. Open the dictionary and use the same word and just spell it differently it will bring and have an entirely different meaning and you will acquire a little more strength and joy in turning that pessimism into a beautiful optimism. Rejoice in all things, learn to rejoice even in sadness you can find some peace during your storm! 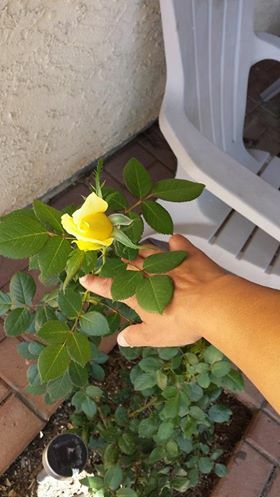 A beautiful rose I thought I never could grow, guess what I did it! And its beauty has the thorns to remind us that beautiful things can still have pain attached to it..